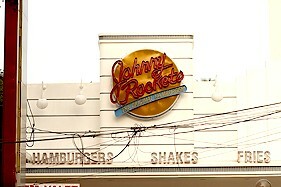 Here is a look around Timog Ave. and T. Morato Ave. My wife and I took a stroll Friday morning so we can shoot photos of the streets and upload it to Google Earth and Wikimapia.� From our house, we headed down towards Timog Ave. Timog Ave. is a commercial area located in Quezon City. You will find lots of restaurants and clubs lined up in this street. There's also a couple of� autoshops, and exotic car dealers where you can find Porsches, Lambhorginis, and the likes. 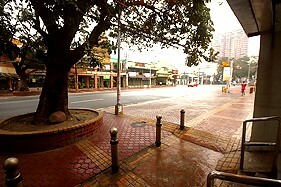 What I like about Timog is the trees on the sidewalk form a canopy over the road. However, the sidewalk could need some cleaning up. All the way down to the Rotunda, litters of every kind are everywhere. The city government should make an effort to install trash receptacles at every corner of the street so people won't resort to becoming litter bugs. At the end of Timog Ave., perpendicular to EDSA, you will find GMA Network. I believe it's the second largest broadcasting network here in the Philippines. I have a friend who works at the new media department of GMA but I have yet to ask him to give us a tour inside. 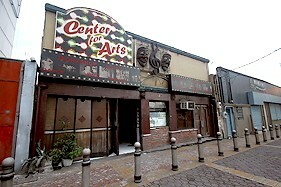 This is the Center for Arts bar. A couple of years ago, my friend, Eric Uy invited us to see him perform here with his band. 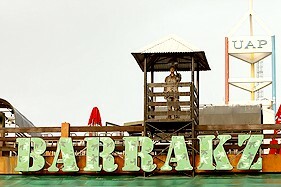 This was a venue where amateur bands perform to showcase their talents. Unfortunately, it's already closed. 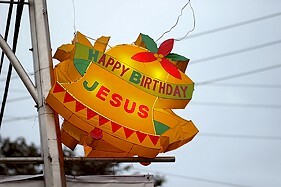 Lanterns like this were installed at every lamp post. Notice the letters H, B, and J are of different color from the rest? They are the initials of the Quezon city mayor and Vice mayor. 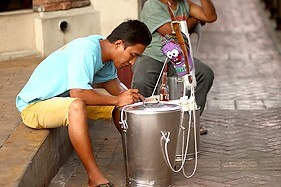 It's very common in the Philippines to mark every government project with their names. It drizzled that morning and I hate to see my camera get wet. First time it did we went inside a Select, a convenience store owned by Shell, and bought some chocolate drink. 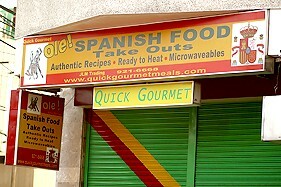 Second time we took shelter in front of Santi's Delicatessen, a food and beverage specialty shop. My wife frequents this shop before when she needed hard-to-find ingredients. 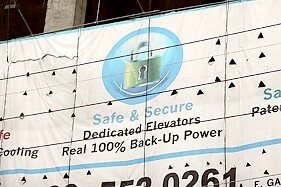 A large sign hanging on a construction site. You will also find a few gay bars here. You will easily know which one. My wife prodded me to take a photo of the signage. 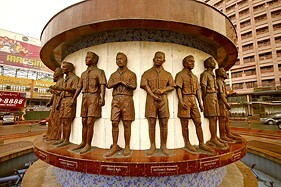 Boy Scouts of the Philippines 11th World Jamboree Memorial Rotunda. 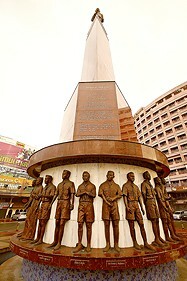 This memorial was erected in memory of the Filipino scouts and scout masters who died in a plane crash in Bombay, India on their way to Marathon, Greece. If you are looking for a smorgasboard of restaurants in Quezon city, Tomas Morato Ave. is the place to be. This area could be heavily dense with car and human traffic during Friday and Saturday nights. 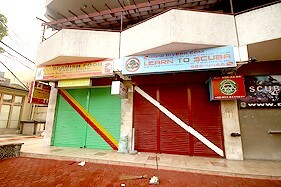 Surprised to see a scuba school here. The nearest beach I know is Manila Bay which is about an hour away from this place. 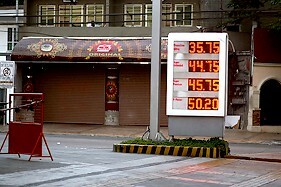 Drive thru Jollibee breakfast for early morning commuters. 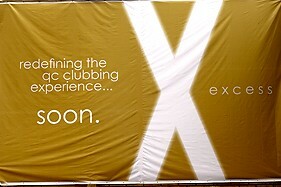 A new club under construction called Excess. 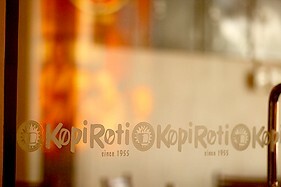 We stopped by Kopiroti to order coffee bun but ended up with sio mai instead. 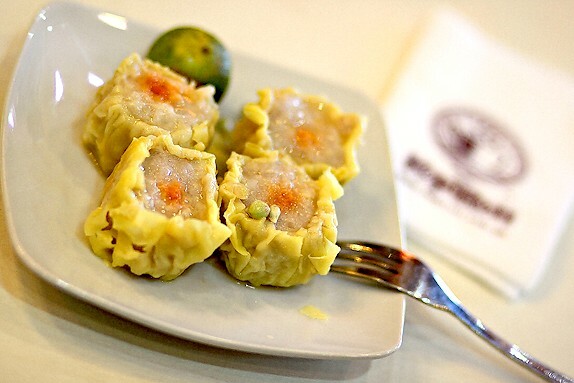 Chinese dumplings are called sio mai in Manila. 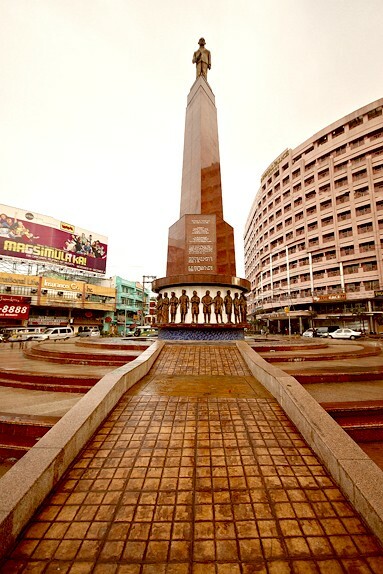 Leo Ilagan ngayon ko lang nakita ang morato na walang tao. ganda! 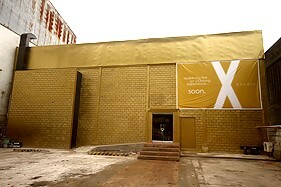 disco dancing Club Excess looked like a giant square block. Now, where's the fire exit? Dudes We passed by Excess yesterday. It's already open and happening!!! jane hi! I'm just dropping by. and I just read your posts. I just want to ask if what camera are you using? :) thanks!and is it nikon? canon? sony or what? Marcel Hi Jane, I'm using a lowly Canon 500D and 350D. But there shouldn't be any difference whatever camera or brand you are using. 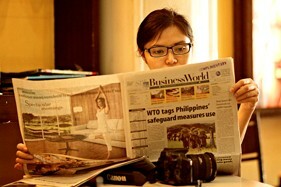 What makes the difference are the lenses and YOUR EYE. The camera is just a recorder of what goes through the lens. Marcel Update: Barrakz is gone and is now Papa John's Pizza.